Milton Ross Plum was born on January 20, 1935 in Westville. Behind his home were a baseball diamond and football field; he made good use of both as a boy. Milt rooted for the Phillies and Eagles, who played right across the river in Philadelphia. He played quarterback and did the kicking for Woodbury High in the neighboring Gloucester County town of Woodbury. He was also a power-hitting catcher for the baseball team. The school had a great sports tradition. One of Milt’s classmates was track star Van Bruner. In the 1950s, Penn State basically had dibs on the best football talent in South Jersey, so naturally they offered Milt a scholarship and he accepted, turning down offers to sign a minor-league baseball contract. He hoped to continue his two-sport prowess with the Nittany Lions, but competition for the quarterback job was fierce at Penn State, so he spent his springs practicing his football skills and studying game films with the quarterbacks coach, Joe Paterno, who was still in his 20s. Milt played quarterback and safety for head coach Rip Engle, rarely leaving the field during his last two varsity seasons. As a sophomore, he was a member of the 1954 squad, which finished with a Top 20 ranking. Besides his passing prowess, Milt was a terrific punter. As a senior in 1956, he nailed a 72-yard coffin corner against the heavily favored Ohio State Buckeyes that led to an upset win. On defense, he picked off 7 passes one year and could have had a couple more, but batted down fourth-down attempts. As a junior, Milt made a jaw-dropping open-field tackle against Syracuse star Jim Brown, who appeared headed for a certain touchdown. The Lions lost that game, but Milt led them to a major upset of powerhouse Tennessee. As luck would have it, Milt and Jim would become teammates two years later. 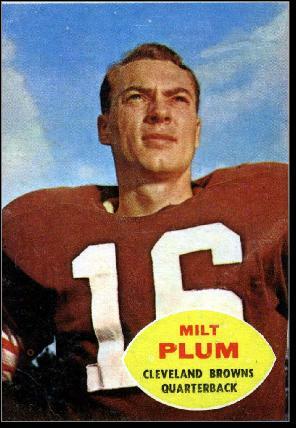 In 1957, the Cleveland Browns took Brown with their first pick and Milt with their second. His job was to fill the shoes of the great Otto Graham. In training camp, coach Paul Brown tabbed veteran Tommy O’Connell as the starter. Early in the season, O’Connell injured his ankle against the Eagles in Philadelphia. Milt’s friends and family got to see him play in a 17–7 loss. It was one of only two losses for the team that season, as the Browns finished 9–2–1 and won the Eastern Division. Milt ended up starting three games and played nine in all. He completed 41 of 76 passes with 2 touchdowns and 5 interceptions. He played the second half of the NFL Championship Game, a 59–14 wipeout at the hands of the Detroit Lions. The Browns were already behind 31–7 when he got into the game. Milt won the starting job in 1958 and held the job through the 1961 season. With Jim Brown and Bobby Mitchell in his backfield, Milt had no trouble finding receivers in single coverage. He led the NFL in passing percentage in 1959, 1960 and 1961. In 1960, Milt had his finest campaign as a pro. He completed 60.4 percent of his passes, with 21 touchdowns against only 5 interceptions. When QB Rating came into vogue as a stat in the 1980s, historians calculated Milt’s 1960 rating at 110.4—the highest in history to that time. It still ranks among the best ever. He was named a second- team All-Pro and played in the Pro Bowl after the season. He went to the All-Star Game again in 1961. With Milt at the helm, the Browns finished in a first-place tie with the Giants in 1958. They lost the subsequent play-in game to New York 10–0. It marked the second time since the Browns came into existence that they did not reach a league title game. Cleveland posted winning records in Milt’s final three years at quarterback, but did not get back to the postseason. The Browns traded Milt to the Lions after the 1961 season. He had become critical of the team’s offense. He begged Paul Brown to use Bobby Mitchell more as a receiver, but got nowhere. The Cleveland receiving corps was basically Ray Renfro. Even more frustrating to Milt was the fact that Brown was still sending in plays from the bench—and forbidding Milt to change his calls. With blitzing becoming more common, Milt often ran plays he knew were doomed. He once said that if an opponent’s entire defensive backfield went to the bathroom for a play, he would still have to hand-off if that was the play that was called. A story hit the wires after the 1961 season that said if Cleveland had an audible system, the Browns would have won another championship. The quote was attributed to Milt. He was traded soon after. In Detroit, Milt competed with Earl Morrall for the starting job. They shared the position in 1962 as the Lions won 11 games but finished behind the Green Bay Packers. Morrall took the job away from Milt in 1963, but Milt took it back the following season. The 1964 campaign was his best as a Lion. He threw for 2,241 yards and 18 touchdowns. Milt could not keep up his high level of play in 1965, and in 1966 he injured his knee. After one more year in Detroit, he served as Roman Gabriel’s backup with the Rams in 1968 and as Fran Tarkenton’s with the Giants in 1969. He had considered calling it quits in 1968, but coach George Allen convinced him to come to LA. Milt worked in the wood products industry before retiring to North Carolina. He suffered from hip problems after football. Once a year, he makes the trek up to Penn State to visit with his old quarterbacks coach, who still was employed by the university in 2011.